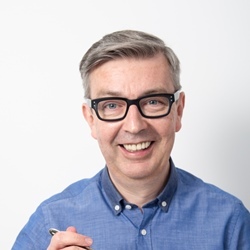 As the first ever botanical-based week puts the bakers through their paces, Howard Middleton tells us who came up smelling like roses and which bakes were destined for the compost heap. 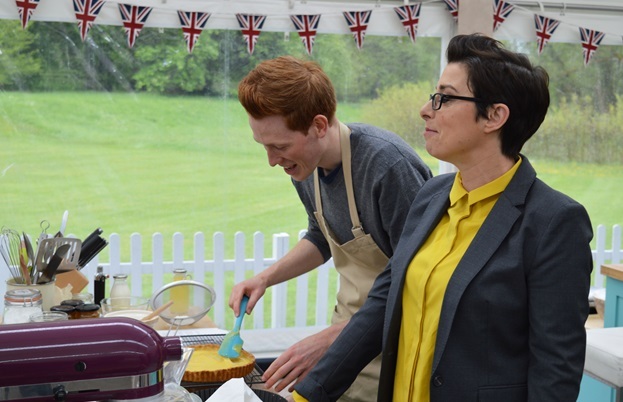 Over half way through the competition and Bake Off turns over a new leaf this week with a theme that’s (to quote the divine Ms B) ‘totally original’. Yes, following on from the success of last year’s unexpected addition of Victorian week, we now have the tent hosting a flowery flour show as the bakers go ‘Botanical’. We join our baking bunch on what appears to be a day that’s lovely weather for waterlilies. It’s not ideal conditions for cultivating the stiff peaks of meringue needed for the signature bake of a citrus meringue pie. In case you were wondering, that’s like the perennial favourite, a lemon meringue pie, but with (barely a handful of) fruity variations. Mary’s particularly picky about the crispness of the meringue topping, favouring the good old-fashioned oven-bake over any fancy pyrotechnics with blowtorches. Mary and Selasi compliment each other on their fittingly floral outfits. He’s baking a grapefruit and orange tart with a classic French meringue. There’s a bit of a debate with Paul about the correct pronunciation of physalis – Mary just calls it a Cape gooseberry. I fancy that Mary has some wonderfully retro names up her sleeve for all sorts of ingredients, like when avocadoes were once ‘avocado pears’ and Paul was once called ‘loyal’. Ah, those were the days. Anyway, back to Selasi’s curd, which she calls ‘stiff and cloying’. 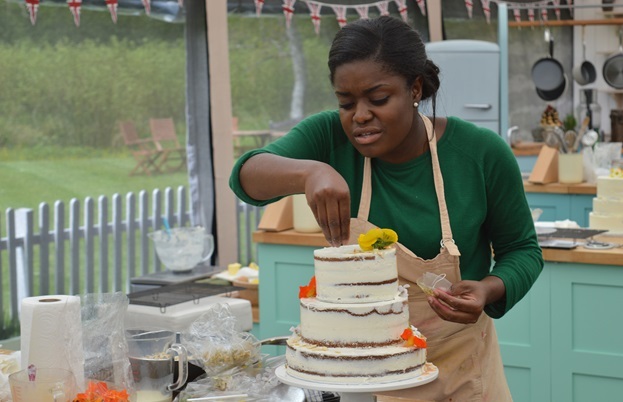 Benjamina is also using grapefruit, which she gingers up and tops with Italian meringue. Sensibly baking and torching, Mary says it’s ‘a very good job’. 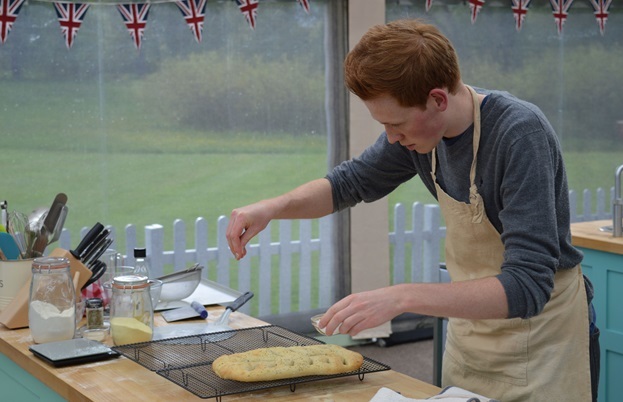 Perhaps unsurprisingly, Andrew also goes ginger, with a tangy tart that takes inspiration from a key lime pie. The lime curd is judged to be ‘beautiful’ but his pastry is too thick. Limes are also on the menu for both Candice and Jane – the latter reveals a fondness for Harry Nilsson lyrics: ‘put the lime in the coconut and drink ‘em both together’. Candice could certainly do with a stiff drink as her peaks of striped meringue pipe out more neon than expected. I think they actually look quite neat, but she impulsively decides to take a knife to them and swirls them to oblivion. With a face that says ‘now look what I’ve done’, she calls her work ‘horrendous’. Paul agrees it looks awful but says it tastes OK.
Rav’s risking the Berry wrath by only blowtorching the Italian meringue on his margarita-inspired pie, with a delicious sounding mandarin and tequila curd. Sadly the finished article is said to be ‘too soft’. 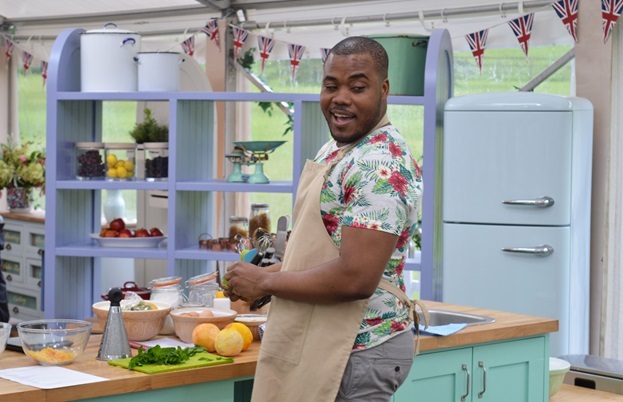 Tom’s blood orange and pumpkin pie has a Halloween theme but the judges decide it lacks bite – ‘too sweet and not enough citrus’. 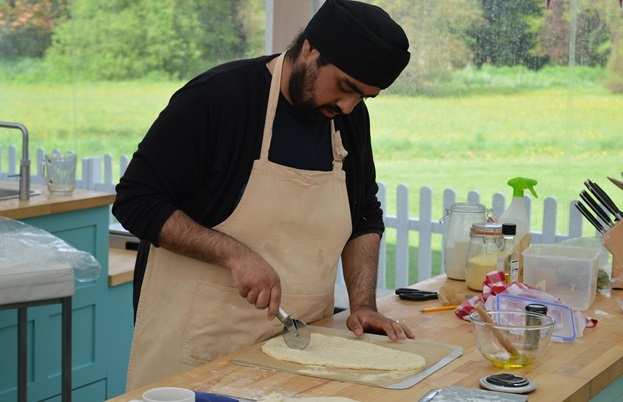 In this week’s technical, Paul’s challenging the bakers to make two herbal fougasse. I daren’t repeat how Mary pronounces this in the privacy of her little tent, but suffice to say the ‘g’ sounds more like a ‘c’. The flatbreads should be slashed to resemble a leaf. This confuses some bakers who overthink the instructions and produce specimens with two primary veins and no obvious pinnate venation. Really, it just needed to look like a leaf. Selasi’s under-baked offering puts him at the bottom of the leaf pile and despite a fine showing from Benjamina, Tom finishes on top. 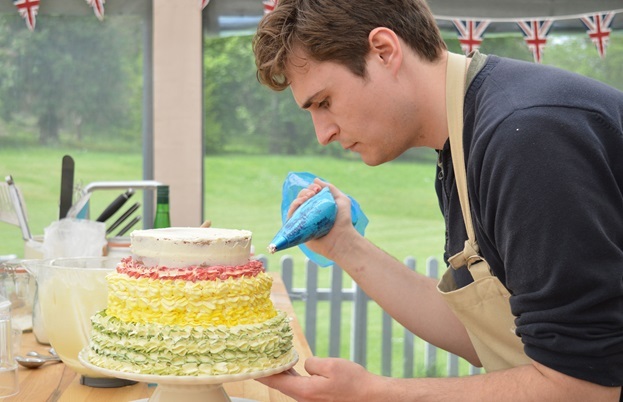 For this week’s showstopper, the bakers must produce a three-tiered ‘floral’ cake. Mary has often been somewhat sniffy about flavours like lavender and rose so it’s not easy for our bunch of botanical bakers to get the Berry balance right. Benjamina’s risking some unusual flavours, including chamomile, honey, poppy seed, orange blossom and almond. It’s meant to be a ‘semi-naked’ cake but its informal lack of attire doesn’t go down too well with Paul and Mary. It’s not quite done either. Cake clothing may be optional but baking and flavour is strictly de rigueur. Andrew’s playing hide and seek in the garden with his flavours. His vanilla cake has been deliberately hiding a punnet of strawberries in a flurry of Swiss meringue buttercream but the elderflower is even more elusive. Mary says, ‘it’s so subtle I can’t find it’. For garden designer Jane, this week’s theme should be right up her gravel path. However, she controversially decides against putting anything genuinely flowery in her cakes, choosing a single flavour of orange throughout and promising handmade floral decorations. Unhappy with her mix, she bins it and starts again, putting her dangerously behind time. 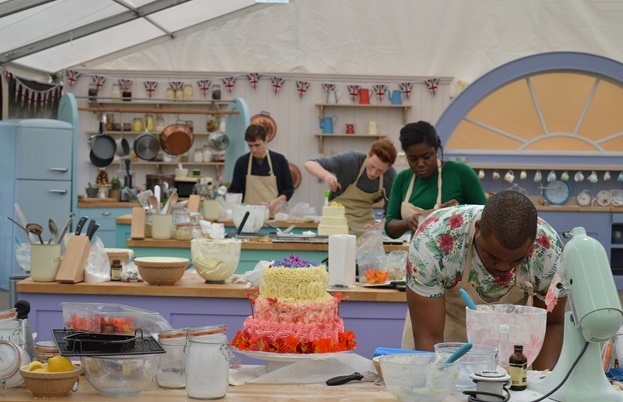 Ironically, her finished cakes are judged to be over-baked and her colourful white chocolate collars are called ‘a mess’. Paul goes on to say that the decoration looks like mashed potato. Poor Jane! Well, at least vegetables are in keeping with the theme. Candice is challenging herself to produce an extra tier, as her cakes represent the four seasons in an impressively colourful and deliberately higgledy-piggledy style. Winter is a boiled fruitcake made to a family recipe, autumn is carrot cake, it’s lemon, raspberry and rose for summer and a gluten-free chocolate, almond and orange cake for spring. Candice manages to say ‘it’s gluten-free’ to the judges in a way that is both informative and provocatively challenging. 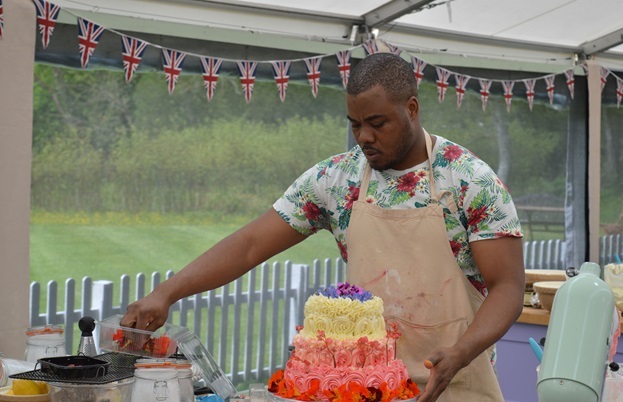 Selasi’s ombré cake has tiers of carrot, lemon and poppy seed and strawberry and vanilla. His expert piping is blooming brilliant, producing beautifully subtle roses of buttercream. The judges admit it’s ‘impressive’, ‘beautifully baked’ and every layer is deemed ‘perfect’. It has star baker potential iced all over it… if only he hadn’t made such a foug-up of his fougasse. Rav admits that he’s not a flowery kind of guy and hates piping but he seems to be making a pretty good job of his decorations. 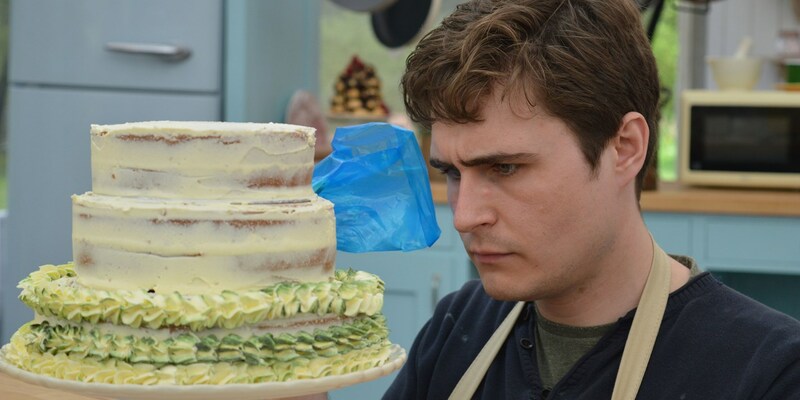 Unfortunately, there’s no variation in his flavours – he sticks to orange blossom, almond and vanilla in all three tiers – and the judges decide it’s not very creative and ‘a bit samey’. Probably taking the biggest flavour gamble, Tom infuses the butter for his Genoese sponges with different teas – chamomile, elderflower and jasmine. He checks their potency by resting the tip of his nose on the top of each cake. Nice touch Tom. Nevertheless, the sniff test works wonders and the judges decide his cakes are ‘brilliant’ with very pleasant flavours. Paul says it’s the hardest judging they’ve ever had, but Tom is finally awarded the prize of best in show, and despite lots of shots of an anxious Andrew, it’s poor lovely Rav who is sent home. It’s especially poignant to see a baker leave in the same week that I did. Sadly, there will always be some botanical bakers destined for Chelsea and others, like me, at the back of the Kew.